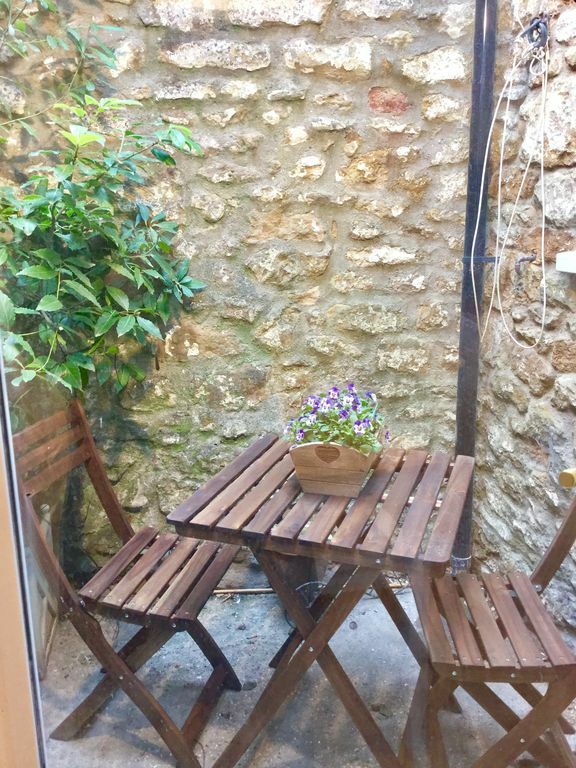 Bensly Cottage is a pretty and newly refurbished character property in the middle of the beautiful market town of Sherborne. It has a view of the magnificent Abbey, and is only a few minutes' walk from the town centre, with its pubs, restaurants, delis and tea rooms. The two castles are also reachable on foot, and delightful country walks are easily undertaken from the cottage. There are many historic sites, country pubs and beautiful countryside to visit in the surrounding area. Sherborne offers shops, cultural events, markets and music, and, of course, its famous schools. The cottage is comfortable and well equipped. The ground floor consists of a sitting room with wood burning stove, furnished with a comfortable 3 seater sofa and an armchair. There is television (with internet freeview channels and apps) and free wifi; a DVD player with a selection of movies, and a bookcase with plenty of books to read. There is also a welcome folder with maps and information about local attractions. Leading from the sitting room is a fresh, attractive Shaker-style kitchen with washer drier, dishwasher, microwave, oven with electric hob and large fridge freezer, plus all utensils. A dining area at the rear sits four, with access to a small courtyard for al fresco drinks. Upstairs are two comfortable bedrooms, one double and one smaller room with bunk beds. There is a modern bathroom with a bath including a shower, a basin and WC. There is central heating throughout. Bed linen, towels and bath mat are provided. The cottage is a seven-minute walk from the railway station (direct line from London Waterloo) and Sainsbury's, and a ten minute walk from Waitrose. There is on-street parking opposite, depending on availability, and two long-stay car parks within a short distance. The owner can direct you to nearby convenient parking on request. A leisure centre nearby offers an indoor pool, gym and fitness classes. The town has a range of gift shops, antique and reclamation shops, galleries, beauty parlours and clothes shops. Besides tea rooms, cafes and delis, the town has a variety of places to eat, including a pizzaria, a Italian small plates restaurant and a gelatoria. Dine in style The Green or The Eastbury, both short walks from the cottage. Enjoy traditional ales and pub grub at the Digby Tap. A fantastic fish and chip shop is open in the evenings and is only round the corner. For visitors to the local schools, it may be of interest to know that the cottage is in close proximity to Sherborne Prep, Sherborne School and its boarding houses, Sherborne Girls School and Sherborne International. Leweston Girls School is a five-minute drive, and a taxi service is available in the town. The cottage is named after W.J Bensly, a master at Sherborne School in the early 20th century, who once owned it. He was a tutor of Alan Turing, and well known and loved as a gentle eccentric, who once played cricket against Arthur Conan Doyle and won medals for bravery in the First World War. Well equipped bathroom with hot water on demand, electric shower over the bath, heated towel rail and WC. Each bed has a light but warm duvet and a blanket, and two pillows per person. Linen included. Towels, handtowels for four people, and a bath mat. An attractive wood burner and a load of logs is supplied. More can be provided at £2.50 per load, or they are easy to buy locally. Comfortable living area that seats four people and has under stairs storage for coats and shoes. Two ovens and a grill. Basics (salt, pepper, sugar, oil, tea and coffee) are supplied. A welcome kit provides fresh essentials. Locally supplied ready meals can be left in the freezer if desired - ask for details. The kitchen is well stocked with pots, pans, china, glass, cutlery and utensils to serve four people comfortably. Tea towels, apron etc provided. Cafetière and teapot. Fresh bright kitchen fully equipped with china, cutlery, pots, pans and utensils. Tea towels included. A good sized dining table overlooking the little courtyard. Internet television with all free view channels, IPlayer, and access to apps such as Amazon Prime and Netflix. A selection of reading is on the bookshelves. Some board games, puzzles and cards are available. A selection of films is available. Small enclosed courtyard garden with table and chairs. Sherborne Golf Course is a short drive outside the town. This period property is not suitable for wheelchairs. Parking is available on the street outside, on a first-come, first-served basis, and it is easy to stop and unload, before parking. Two long-stay car parks are within a short walk, and the owner can direct you to convenient parking at the time on request. Cosy and well appointed cottage, close to the Abbey. My friend and I had a fabulous weekend in Sherborne. The cottage was very cosy and the owner had thougt of everything needed to feel at home. Tastefully decorated , comfortable beds and furnishings, the cottage even had a tiny but cute courtyard. Located just a short walk from the Abbey and high street, which had a street market. Great pubs and places to eat. We stayed for a couple of nights in February 2019 and wished we booked up a couple more. Everything we needed was to hand in this charming house which was further enhanced by it's proximity to the town. We'll definitely be visiting again. Beautiful property, everything we needed and just round the corner from the town centre. Couldn't have asked for a more pleasant stay and Kirsty was fantastic, she couldn't have done any more for us. Have already recommended the property to several people and hope to stay there again ourselves sometime soon. We had a very enjoyable mid-winter stay in Sherborne. The cottage is perfectly set up, warm and cosy and very well-equipped. Kirsty was extremely kind and helpful with eveything to do with our stay. The cottage is beautifully situated; quiet, yet just around the corner from Sherborne Abbey, the main thoroughfare of Cheap Street, and the great hostelry that is The Digby Tap. We'll be back if we can! Visit Sherborne Abbey, with its stunning fan vaulting and painted interior. Sherborne Castle has grounds laid by Capability Brown and a beautiful interior. The Old Castle is a picturesque ruin once owned by Sir Walter Raleigh. See the famous Sherborne School, and visit the many shops, galleries and tea rooms. The town pubs offer a warm welcome and good food. The beautiful Dorset countryside is on your doorstep, and many historic sites and houses are nearby. Well-behaved dogs may be allowed (downstairs only) on request at an additional cost of £15.